“What else is new” Mom. Cue laugh track. 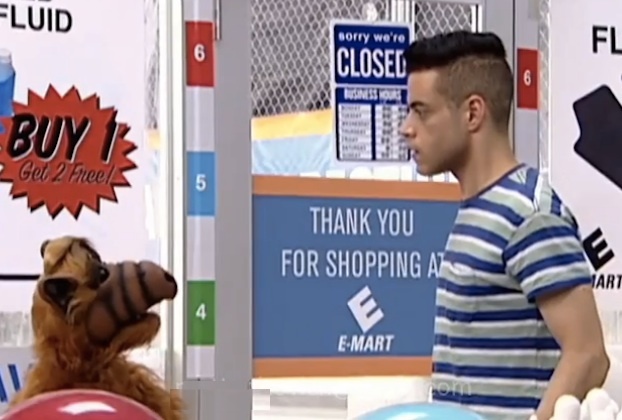 They stop at a gas station and when Elliot enters the ‘E-Mart” he runs into ALF!! What the? Just when you think it couldn’t possibly go on it does go on and on. There’s a noise coming from the trunk and it turns out to be a bound and gagged Tyrell. Elliot is completely horrified and believes that it all means that Mr. 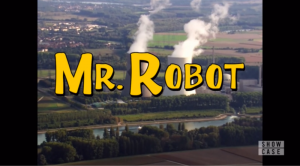 Robot has won and has taken over completely. Mr. Robot assures him just the opposite. He’s created this alternate universe as a place to hide while he covers from the horrible beating Ray and his men have given him. “Sometimes lies can be useful, Elliot.” Mr. Robot tells him, “We had a destination after all.” And he walks him to the front of a hospital. 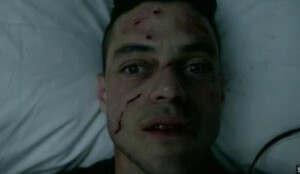 When Elliot comes out of this hallucination he finds himself in the hospital, severely beaten and scarred. Ray is there to tell him a story about how his dog got sick and he needed the care of a human. His dog is alive only because of him. He needed his master. Elliot is only alive because Ray told his men to stop the beating and bring him to the hospital. Ray is now Elliot’s new master.This was a very brave and daring exercise. More than ever the show is doing deep dives into Elliot’s psyche. This segment could pass for a long skit on the great 80’s variety show SCTV. Loved how the mom kept punching Darlene unconscious. This is the most action Mom has seen all season! Cisco goes to The Dark Army to get the femtocell that Angela will take with her on her mission. But when he asks too many questions they jab him in the finger with a long needle! Whaaaat? Did they implant a tracking device? When Cisco meets with F Society to hand over the femtocell Angela recognizes him as the guy that blackmailed her into downloading that disc into Allsafe last season. She says nothing and heads out. Darlene sets up shop in a hotel room near E Corp. I loved her disguise. She wore trench coat and platinum blonde wig looking just like Barbara Stanwyck in Double Indemnity. She and Mobley try to walk Angela through the hack. Angela walks up to the floor where the FBI is staked out and walks into the bathroom to work. She has trouble at first but Darlene and Mobley get her through it. When she exits the bathroom she runs into a young good looking agent who starts flirting with her. When Angela doesn’t succumb to his wiles the agent starts asking her what she’s doing on a restricted floor. Angela turns on her charm and agrees to meet him for lunch. That’s all he wanted! He drops all the security crap and struts away like a conqueror. Angela hooks up the femtocell and it all seemed so easy! Until Darlene tells her they lost the wifi and she needs to go to her terminal and reconfigure it. Darlene is talking in her ear and telling her what to type in, people are walking behind her, Angela is freaking out when she hears a voice call her name. It’s Agent DiPierro. “Oh! Are you on a call? I don’t want to interrupt you.” She says. This sequence was tight and tense. This is more of what the show needed this season. We need to get out of Elliot’s head and into some real life action! DiPierro obviously survived the attack in Beijing (her partner did not). Her boss wants her to take 4 weeks off to recover but DiPierro is not having it. She seems to be the only one that sees that the attack was by The Dark Army (remember she saw those guys at the airport wearing Dark Army masks?). The attackers ended up killing themselves rather than be taken. They erased their own programs. She should have been dead! The attack was only meant to scare them off. She’s a smart cookie. I’m looking forward to the episode that places her and Elliot in the same room. That will be exciting. Ray’s henchmen take Elliot from the hospital and dump him on the floor in an empty warehouse. He’s still badly hurt. Ray is training him to obey. Mr. Robot appears to him again. “Before you get bent out of shape, all I was trying to do was take the punches for you.”, he tells Elliot very sweetly. 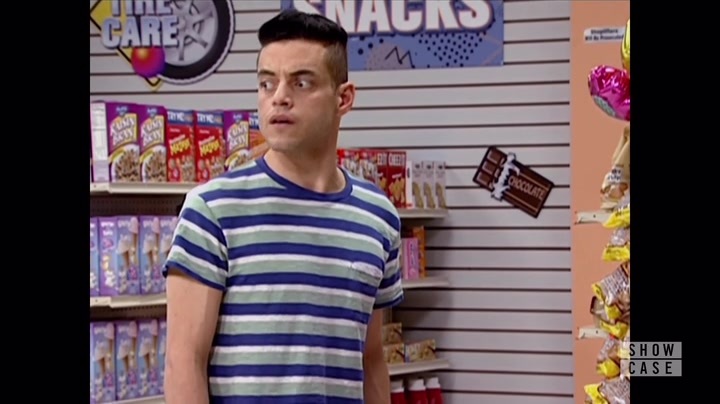 Elliot pulls himself off the ground and lunges into Mr. Robot’s arms. He looks at him and with tears running down his face says, “Thank you.” They embrace. Does this mean their fighting is over? Are they going to start working together? Elliot needs a friend right now. It might as well be himself. The episode ends with a flashback. Dad is driving Elliot home from school. Elliot’s been in a fight, his face is bruised. Dad confides in him that he lost his job because he’s sick and been taking time off to go to the doctor for treatment. He’s been keeping it a secret from everyone, even his wife. Elliot looks devastated by this news but Dad reassures him, “I’m never gonna leave you. I promise.” He tells him about the new business he’s starting. 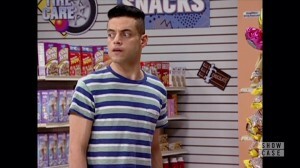 He’s opening a computer store and he wants Elliot to name it. He pulls up in front of the building. “The first thing that pops into your head”. Elliot closes his eyes and we cut to black. Gee, I wonder what name he came up with? I get lost in a lot of the computer jargon so I like when the action is easy to follow. This episode was really ambitious with that opening sequence and Ray is becoming quite the villain. I’m not sure if season two is matching the narrative brilliance of the first season but it’s not for lack of trying. Maybe trying a little too hard. But I’ll take that over trying to coast on past glories.